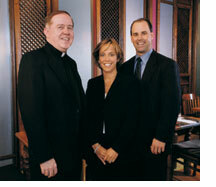 University trustee Peter W. Bell '86, chairman and chief executive officer of StorageNetworks, Inc., in Waltham, Massachusetts, and Marilee Bell '87, former assistant district attorney for Middlesex County, have committed to making a record gift to the Boston College Ever to Excel Campaign. While the gift total has not been disclosed, University officials say that it is the largest gift ever received from alumni who graduated during the 1980s. "Boston College is a big part of our lives, not only academically, but personally. We have made lifelong friends at BC. This is truly a special place for us," said Marilee Bell. The Bells met when they were BC resident advisors together. Peter earned a bachelor's degree in accounting and Marilee earned a bachelor's degree in marketing. "BC has become one of the most important universities in the country. The Jesuit tradition provides the foundation of the BC community. I feel very fortunate to be part of this community and look forward to seeing BC students and alumni continue to play a vital role in shaping the world we live in," said Peter Bell. Peter Bell has been a University trustee since September 2000, and is currently a member of the Trustees Committee on Finance and Audit. Recently he was named a cochair of the Ever to Excel Campaign. "One of the things that is really unusual about this gift is the age of the donors. In some ways this is really a historic gift because never before in the history of Boston College have two young alumni made a commitment to Boston College at such a significant level," said University trustee Jack Connors, Jr. '63, cochair of the Ever to Excel campaign. "It is our great pleasure," said Peter Bell, "to support this campaign, which will allow Boston College to pursue its goals and make those goals become a reality. Boston College is an exceptional university and the future holds great promise for its continued success."